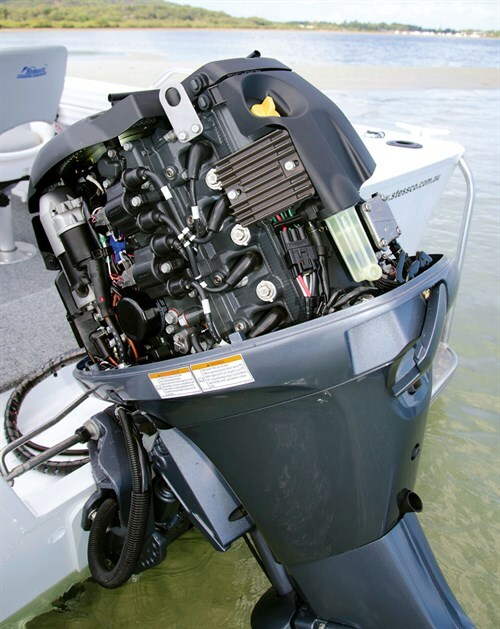 The Yamaha F70 outboard has been on the market since 2010, so it’s no surprise that it’s one of the most popular marine engines on mid-sized boats. We recently got to review a Stessco Renegade 480, pretty much straight from the factory. This aluminium boat was powered by a Yamaha F70 outboard, a marine engine that was far from a big and beefy chunk of mega horsepower on the back of our test. 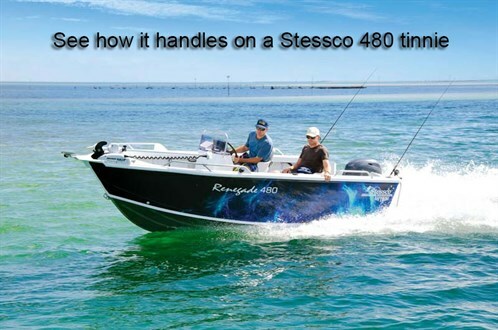 The Stessco Renegade 480’s deep transom and high sides just about hid the motor from view. Cosmetically, the Yamaha F70 is a slimline, compact and very stylish looking package that’s proved to be one of Yamaha’s top motors since it was released in 2010. The 16-valve SOHC inline four-cylinder packs a healthy 996cc of compact grunt, weighs in at a mere 119kg, and to date has produced some really impressive fuel efficiency numbers on various boats. So would it produce the goods on the Stessco Renegade 480, which weighed in at just short of a tonne? Spinning a 13.5in x 15in alloy prop, the Yamaha F70 whipped the Renegade 480 from rest to 40km/h (21.59kt) in 8.43 seconds – taking a distance of 52.94m. That’s not bad going at all and is definitely a perky holeshot considering the boat’s size and weight. 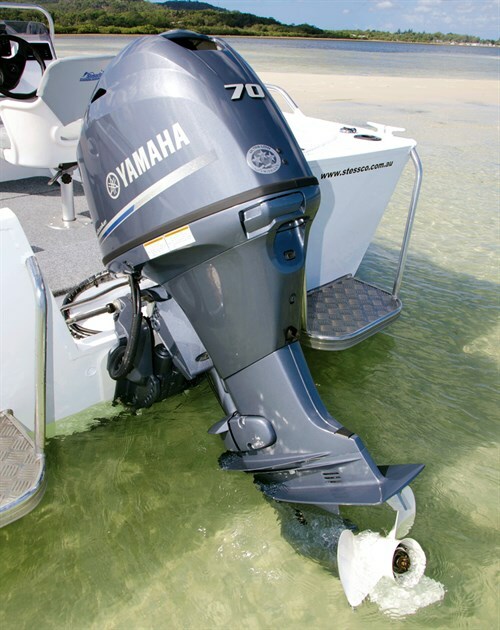 Knocking the hammer down to WOT, the Yamaha F70 outboard motor is responsive and cranks up to an impressive top end of 30.34kt at 6000rpm, more than adequate for a boat of this size and style. The F70 is also far from harsh on the ears at 6000rpm and you can have a reasonable conversation without having to scream at each other. It’s also very economical at WOT – sipping a cheap 22L/h or 2.5km/L. Dropping back on the throttle down to 4000rpm gives the optimum cruise speed of 33.8km/h (18.25kt), sipping away at 10.1L/h or achieving a distance of 3.35km/L. This kind of economy will get you approximately 254km out of a tank that’s 95 per cent full, which would be quite a few local trips on the water before topping up at the bowser. 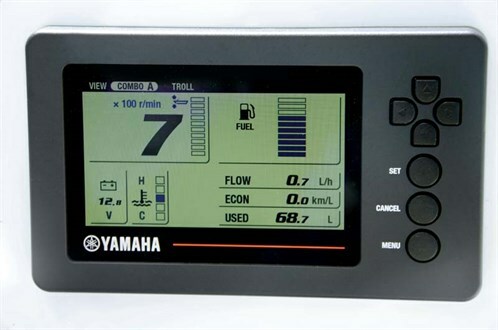 Adding to the F70’s impressive performance and economy, Yamaha has recently released its new Command Link 6YC colour HD LCD gauge and the new 703 remote control. The Command-Link 6YC is now compatible with all Yamaha EFI outboards, from the F30 all the way to the Yamaha F350 and is suitable for single and twin applications. The slim flush-mount gauge has a good-sized screen and tracks engine revs, fuel levels, fuel burn, fuel economy, engine water pressure, surface water temperature and more besides. The new 703 remote control box will most certainly please Yamaha users as it features an updated appearance, new ergonomic grip, new reversible handle for use on right-hand or left-hand installations, as well as the new rotatable grip allowing operation of the power trim and tilt switch with the thumb of either hand. The updated color scheme then complements the rest of the Yamaha rigging line. The Stessco Renegade 480 and Yamaha F70 were a well-matched boat and motor combo – and a surprising one at that. The colourful wrap added to the cosmetic appeal of the boat, the space and layout was a big win for open fishability and the impressive performance most certainly added to the overall package. It makes for a good lure-fishing platform and it’s not a bad option as a family boat either; it has extra seating capability and is well suited to bays, estuaries and dams alike. To top it off, the Stessco Renegade 480 coupled with the Yamaha F70 would make for an economical boat to run, as well as an easy one to maintain, at just under $35,000 for the combo. 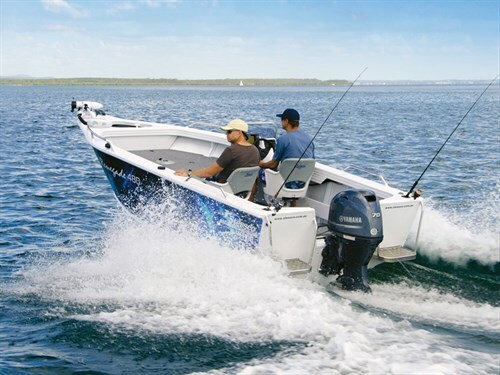 Considering the Yamaha F70LA price ($10,412) for the engine alone, its pricing is not bad considering the size of boat, motor and standard accessory inclusions. Browse our massive archive of Yamaha outboard reviews. Yamaha F70LA, Stessco 480 Renegade two people, 70L fuel, 13.5" X 15" alloy propeller. Range calculated leaving 10 percent in reserve. See the full version of this review in Trade-A-Boat #481, on sale September 8, 2016. Why not subscribe today?